Paper: Ocean beach recycles white and colored paper, mail and envelopes (any color), paper bags, telephone books, Post-Its, etc. Tie items in separate bundles or place in a brown paper bag or box. Place on top of the WRAP can for pick-up. Do not place these items inside the WRAP recycling container. WRAP containers are available in the village office for $10. Don't forget: Recycled materials are collected only on Sunday. 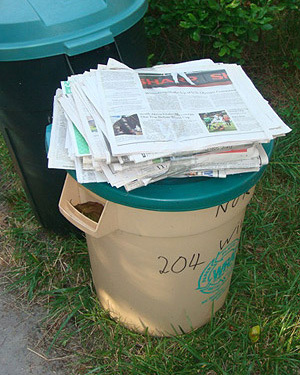 Recycled materials put out on Wednesday will end up in the trash. For 3-day holidays: Trash and recyclables are generally picked up on Monday at the same scheduled time. If you are unsure, call the Village Office (583-5940) for the most current information. Bag law: Effective January 1, 2018, businesses in Suffolk County are required to charge 5¢ for any single-use bag. This legislation was enacted in an effort to reduce waste. Do your part, bring a reusable bag. Possible plastic straw ban: In addition to charging for single-use bags, many cities are contemplating banning plastic straws. We will keep you posted on developments in our area. In the meantime do you part and refuse the straw. Plastic straws clog the ocean and hurt fish. Now there's a growing movement to ban them. VOBEC is a mayor-appointed commission whose purpose is to preserve and improve the quality of the natural and man-made environment within the Village in the face of population growth, urbanization, and technological change and their subsequent demands on natural resources. These areas of focus reflect this mission of maintaining and improving the quality of our life experience and our efforts to foster unified action on environmental problems.